We started Saturday evening off with a sunset flight on the London Eye. I’ve not been on before so I have to say I was suitably impressed. I’m glad the rain held off until afterwards, of course. After many laughs, many bottles of wine later, finally got myself back home after a fantastic weekend to find myself without my beloved Mini Cooper S (they don’t make them like they used to – which is why it seems to spend more time in the garage), and driving a Mini Clubman – an interesting vehicle, though seemingly pointless as it is not much larger than my own car! 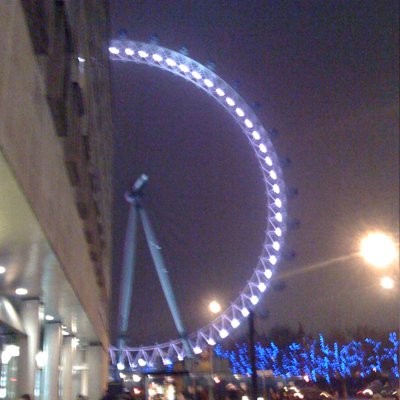 Apologies for the quality, or lack of, of my attempt at an arty nighttime shot of the Eye!